Is Small Business Lending Stuck in the Friend Zone? This story appeared in deBanked’s Sept/Oct 2018 magazine issue. To receive copies in print, SUBSCRIBE FREE Small-business owners have lots of places to go for capital, and the alternative small-business funding industry doesn’t exactly top the list, recent research shows. In fact, entrepreneurs claim they’re more than four times as likely to receive funding from a friend or family member than from an online or non-bank source. That bit of intelligence comes from the National Small Business Association‘s 2017 Year End Economic Report, the most recent from the Washington-based trade group. 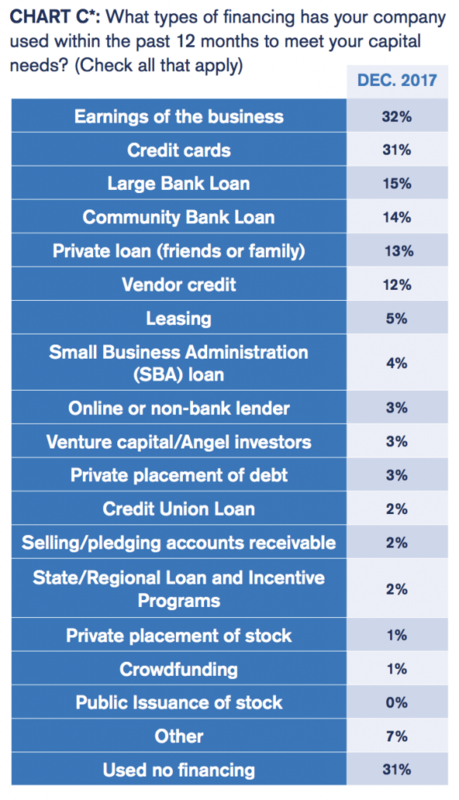 Thirteen percent of the entrepreneurs who responded to the survey received loans from family or friends in the preceding 12 months, while 3 percent obtained funding from online or non-bank lenders, the report says. But some variables come into play. Shopkeepers and restaurateurs are more likely to rely on friends and family for financing during their first five years in business, says Molly Brogan Day, the NSBA’s vice president of public affairs and a 15-year veteran of the survey. The association’s members, who account for many – but not all – of the respondents tend to have been in business longer than non-members so the actual percentage of all owners receiving funds from family or friends could well be higher than the survey indicates, she notes. In fact, the average NSBA member started his or her business 11 years ago – a fairly long time for the sector, Day says. The association attracts well-established merchants partly because the trade group concentrates on advocacy and lobbying in the nation’s capital, Day notes. “There’s not a lot of networking, there’s not a ton of resources or educational offerings,” she says of the association. In other words, the organization’s emphasis tends to attract prospective members who have been in business long enough to see the results of laws and regulation instead of newcomers still struggling daily to establish themselves, she observes. Anyway, it’s also worth noting that small-business owners appear nearly as likely to approach family or friends for cash as to petition large banks for funding, Day says, noting that 13 percent turn to friends and family, while 15 percent manage to obtain loans from large banks. To her, that indicates that banks just aren’t lending to small businesses as frequently as they should – a notion that should sound familiar to anyone in the alternative small-business funding industry. Lending by banks hit another snag in 2012 when new regulation and legislation, including the Dodd-Frank Wall Street Reform and Consumer Protection Act, made itself felt. “There was such a massive overcorrection in the banking industry that it’s still really difficult for small businesses to get loans,” Day says. Moreover, banks were granting fewer “character-based” loans even before the double whammy or recession and regulation, Day observes. Instead of employing the older practice of assessing the intangible virtues of a business owner well-known in the community, bankers began applying a more formulaic approach to evaluating loan applications based on credit scores and other quantifiable variables, she says. That switch to numbers-oriented decisions proved detrimental for many entrepreneurs. “A lot of small business owners don’t look great on paper,” Day admits. Even a great business plan might not convince bankers to loosen their purse strings these days, she notes. That’s where the alternative small-business funding industry comes into the picture. NSBA researchers began including the category of online and non-bank lenders in their surveys in 2013 and have seen the percentage of respondents using them grow each year to its current level of 3 percent. In fact, the NSBA research indicates that alternative funding and other sources have tended to take up the slack created by the banking industry’s decision to exercise extreme caution when evaluating small business loans. 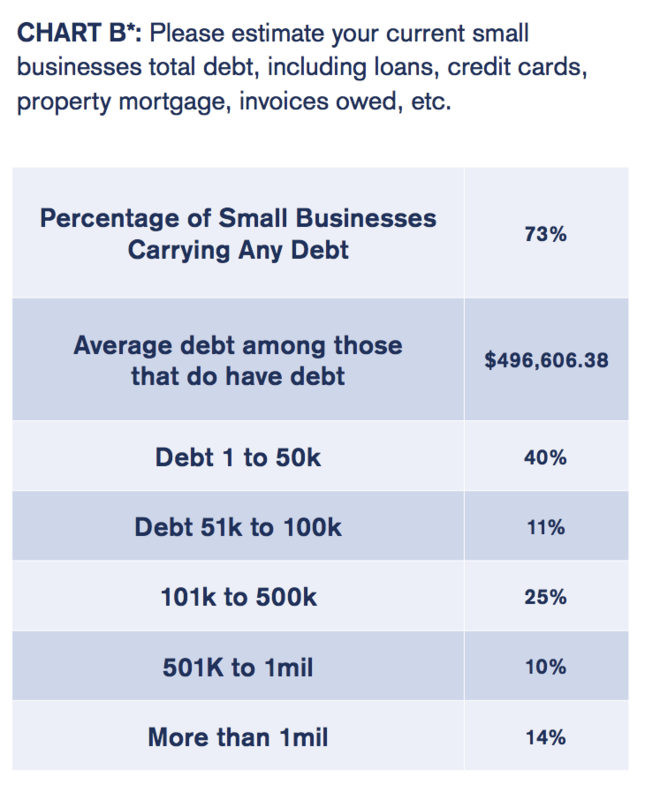 Some 73 percent of small business owners are obtaining enough financing these days, according to the survey. Yet hiccups have occurred, like the decline to only 59 percent finding adequate funding in 2010, Day points out. And the fact that two-thirds to three fourths are generally securing adequate funding means that a fourth to a third aren’t, she notes, adding that she urges focusing on the latter group. “It’s concerning,” she says. Inadequate funding can prove especially challenging for newer businesses that don’t have a track record, haven’t stockpiled proceeds from past operations, don’t own stock to leverage and aren’t savvy enough to finesse placement of debt, Day maintains. More-established businesses have greater access to those resources or have honed those skills, she notes. The availability of credit hadn’t changed much in the year leading up to the survey, the association says. About 77 percent reported no change in their lines of credit or credit cards, while 18 percent saw their perceived creditworthiness increase and 5 percent saw it decline. Those results come with a bit of history. 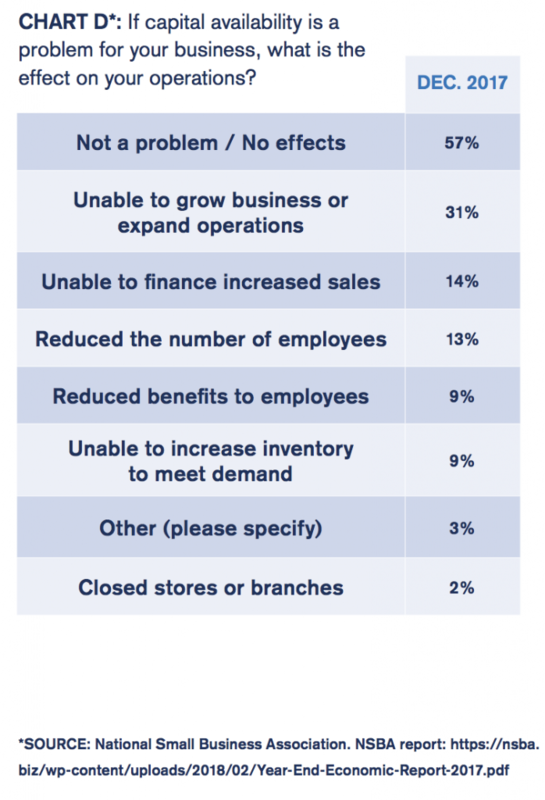 The NSBA has been surveying small-business owners since 1993. At first, the trade group hired polling companies to perform the task and cooperated on the report with the Arthur Andersen accounting firm. Computerization enabled the association to take the project in house beginning in 2007. It works on the survey with ZipRecruiter, an online employment marketplace. Some 1,633 small-business owners participated in the research for the 2017 Year End Economic Report by answering 42 questions online in December 2017 and January 2018. Many of the survey questions have remained the same over the years to facilitate comparisons and tracking. Small businesses on the list of members and the list of non-members receive two email messages alerting them to the survey and providing an online link to the questions. The surveys take place twice a year. As mentioned earlier, some survey respondents belong to the association and some don’t, but Day was unable to pinpoint the percentages. In response to a question from deBanked, she said she may begin tallying how many respondents are members and non-members because non-members tend to have been in business for a shorter time than members. Non-members also tend to differ from members because political engagement often brings the former to the association’s attention. Participating merchants come from every industry and every state, Day says. Manufacturing and professional services are very slightly overrepresented, while mining is the only category that’s scarcely represented, she admits. Not many small businesses operate in the mining sector, she adds. Home › Business Lending › Is Small Business Lending Stuck in the Friend Zone?